First row from left: Samuel Pint, Jacob McAfee, Tyler Kodanaz, Joel Pegg and Warren White. Second row: Ruth Miller, Justice Catron, Jacob Meyer, Jackson Jennings and Andrew Rieschick. Third row: Milan Klempay, Simon Cibulka, Will Brownlee and Sam Wilson. 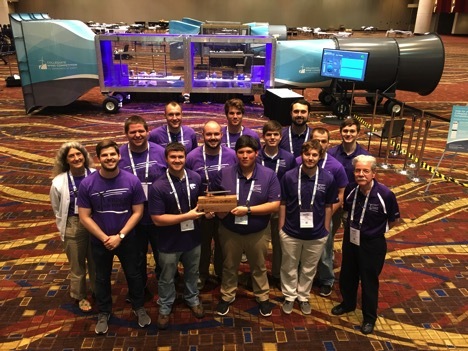 The Wildcat Wind Power team took third place in the U.S. Department of Energy's 2018 Collegiate Wind Competition at the American Wind Energy Association Conference, Windpower 2018, May 7-10 in Chicago. The team competed against 11 university teams in a challenge to offer a unique solution to a complex wind energy project. The teams took part in wind turbine design and construction, wind farm design and addressed the business aspects of renewable energy. Justice Catron, freshman, and Sam Pint, junior in mechanical and nuclear engineering, were charged with leading the wind farm design, which produced the most efficient design of the teams in the competition and translates into a farm producing power at the lowest rate of dollars per kilowatt-hour. K-State's turbine design received compliments in regard to its sleekness, simplicity and superior performance in passively tracking the yawing wind while under test. The electrical portion of the design went well, especially during the durability test and received the team's largest portion of points. "The team's performance pleases me greatly and is a source of pride for the College of Engineering," said Warren White, the team's co-advisor and associate professor of mechanical and nuclear engineering. "The leadership provided by Jake Meyer, president of Wildcat Wind Power and senior in industrial and manufacturing systems engineering, facilitated an organized effort and closely focused the team's attention on the important tasks. Meyer also spearheaded the business portion of the competition." The wind turbine mechanical design team consisted of Joel Pegg, Jacob McAfee, Jackson Jennings, Giselle Guanes-Melgarejo and Matt Bryan, all seniors in mechanical and nuclear engineering. The electrical design team consisted of Tyler Kodanaz, sophomore in electrical and computer engineering, and Will Brownlee, senior in electrical and computer engineering. The bulk of the team's funding comes from a $20,000 U.S. Department of Energy grant. Ruth Douglas Miller, the team's co-advisor and professor emeritus of electrical and computer engineering, and White serve as co-principle investigators on the grant. Supporting funds also were provided by the College of Engineering, the mechanical and nuclear engineering department, and the electrical and computer engineering department. The mechanical design team was advised by David Pacey, professor of mechanical and nuclear engineering. "The common thought shared by the team members as they returned to Manhattan was a firm resolve to do even better at the next competition," White said.